As usual, HP's booth, one of the largest there, occupied one of the central places. Before and during CeBIT the company held many interesting conferences. In one of them the attention was focused on a new universal multimedia standard named MPV. Over a year ago two associations - OSTA (Optical Storage Technology Association) and I3A (International Imaging Industry Association) - announced a new standard named MusicPhoto/Video (MPV). MPV was going to be XML compliant, use current specifications, for example, SMIL 2.0, and be compatible with DCF and EXIF digital camera standards. The idea was to standardize storage of music, photos and video on recordable discs, CD or DVD, as well as on any other storage devices. After that the new standard was nowhere heard of. 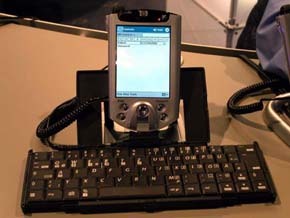 But on the eve of CeBIT 2003 HP was one of the first to announce the MPV support. Other MPV supporters turned out to be ACD Systems, Ahead Software, ArcSoft, Eastman Kodak, LG Electronics, Olympus Optical, Planetweb, Roxio, Royal Philips Electronics, Samsung Electronics, Sonic Solutions and Sony Corporation. Some companies including HP are expected to start shipping first products with MPV support (players and software applications) in the second half of 2003. A control file of MPV format shows storage device's contents - music, photos, video. A device supporting MPV format (CD, DVD, flash player etc.) can quickly read the contents and ensures quick navigation and access to the contents. It's possible to edit play lists without rewriting the storage device. MPV is compatible with ISO 9660-1 and Joliet file systems, supports CD multisession recording. MPV can get support with a small MPV reader. Most programs will require just a small upgrade. It's supposed that MPV will be used in digital cameras, scanners, Internet devices etc. 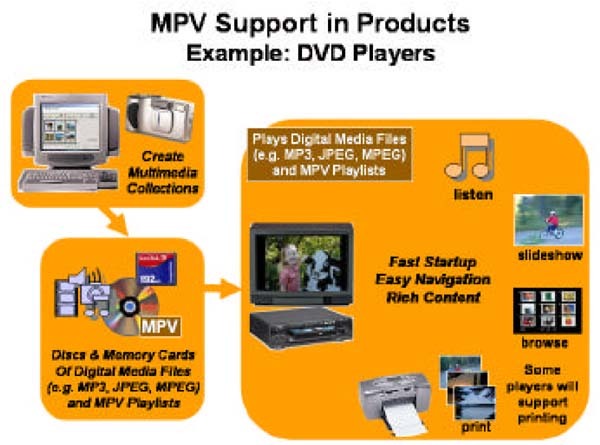 MPV is an open industrial standard and distributed by OSTA (Optical Storage Technology Association) on the free basis. Probably, we will finally get a new universal file audio/photo/video format. Time will show whether the idea will come true. But the fact that such heavyweights as HP, LG Electronics, Royal Philips Electronics, Samsung Electronics and Sony Corporation do support it makes me feel optimistic. 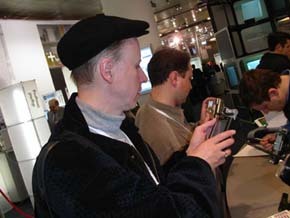 At the display HP attracted visitors' attention mostly with their new laser devices. By CEBIT they announced a series of new printers for home users, small and big offices. It was also the subject of the press conference held in Moscow on March 26 where the company shed more light on the new line. The junior model in the line is HP LaserJet 1005w which is meant for corporate and home users and small-office employees who need to print out various documents quickly, efficiently and easily. This printer ensures clear typing and high-quality graphics. It supports most Windows versions when connected through parallel or USB ports. HP's new personal laser printer supports the resolution equivalent to 1200 dpi due to the ImageREt technology, and a high printing speed up to 14 pages per minute. Thanks to the instant-on fusing technology it takes only 10 seconds to print out the first page. Besides, HP LaserJet 1005w cuts down printing costs because its workload makes 7000 pages a month, and the cartridge filled with toner makes ozone emission significantly lower. Also, Hewlett-Packard announced two new LaserJet printers, HP LaserJet 1150 and HP LaserJet 1300, oriented toward personal use and small businesses. They ensure high-quality and reliable printing at a more acceptable price. The printers offer the printing resolution of 1200 dpi, fast first-page printout (8 sec for HP LaserJet 1300, 10 sec for HP LaserJet 1150), fast printing (HP LaserJet 1300 - 19 pages/min, HP LaserJet 1150 - 17 pages/min), compatibility with any office equipment (HP LaserJet 1150: PCL5e; HP LaserJet1300: PCL5e, PCL6 and PS 2e) and widespread operating systems. HP LaserJet 1150 sports an attractive suite of features which make it a reliable desktop printer for personal use or small groups of 2 or 3 people. With HP's reliable technology and classical printing architecture HP LaserJet 1150 works very efficiently printing bright texts at the resolution of 1200dpi through REt technology. It boasts a terrific speed of 17 pages per minute and throws out the first page in 10 seconds. HP's all-in-one cartridge guaranteed for 2500 pages ensures the maximum output and equally superb printing quality during the whole service life. The printer fits in any office environment supporting the most popular printing standard PCL5e. Easy in installation and use, HP LaserJet 1150 can be connected to the parallel or USB port. HP Jetdirect (HP Jetdirect 175x) print-server which can be additionally purchased turns it into a network printer for small groups of 2-3 persons. According to the company, HP LaserJet 1300 makes it a breeze to print for businessmen working in offices of any kind. In comparison with HP LaserJet 1150, this model offers better expandability being able to print large volumes of documents when necessary. It supports a number of additional features like reliable network printing through hp JetDirect print-server for LIO slot (standard for hp LaserJet 1300n), and is very flexible for small groups of users. The printer's memory can be expanded via the DIMM slot. The printer ships either as ready for network connection (HP LaserJet 1300n) or as just supporting network connection (HP LaserJet 1300), but it can operate in a wireless environment as well through external or internal wireless print servers. With an integrated web server and HP's "smart" supplies HP LaserJet 1300 supports remote monitoring of printer status, printing, and supplies' level. For large or frequent small tasks you can attach an additional paper feeder for 250 sheets. In short, HP LaserJet 1300 can be used as a personal desktop printer which you can be modified into a network device with high-capacity feeders as your business will expand. Both series - HP LaserJet 1150 and HP LaserJet 1300 - are aimed at the maximum satisfaction of needs of small businesses. They use a lot of HP's proprietary classical technologies which guarantee that HP LaserJet printers will be absolutely reliable and efficient even for beginners. This is how HP defines its new solutions. Now let's have a look at some HP's technologies used in HP LaserJet printers which distinguish them in such parameters as ease of use, compatibility, efficiency and price/quality ratio. The speed of the printer's mechanism is measured in pages per minutes or time taken for rolling a page through a printer. But time of printing a task depends on many factors. One of them is heat-up time necessary for a printer to start up. A laser printer has to have a certain temperature at the place where toner is applied. An ordinary laser printer spends a noticeable amount of energy to maintain this temperature. HP Instant-on fusing technology brings to zero the time of intermediate heat-up. Thanks to the ceramic heating elements it takes less than a second to reach the fusion temperature. At the same time, when printing is completed, the heating element returns to its initial state. It helps to save a lot of energy. HP Ret (Resolution Enhancement technology) supported in all HP LaserJet printers ensures high-quality printing through changing dot sizes and arranging more optimal dot positions on a sheet of paper. All printed symbols and images consist of a series of extremely small dots. It can be a reason of a saw-like edge. HP Ret technology makes edges smoother by adjusting dot sizes on the edge of symbols or images. All the new printers use HP's all-in-one cartridges. They contain a protected drum and hermetically packed toner which make printing accurate and controllable. The maximum output and equally high printing quality is maintain during the whole service life of such toner-cartridge. The printing technology with roller for drum charging supported in HP LaserJet 1150 and HP LaserJet 1300 ensures good health protection by preventing ozone formation, and with the instant-on fusing technology it doesn't take much time for the printer to heat up. Besides, this technology lowers power consumption and noise level, and prints out the first page much quicker. A range of monochrome printers is very wide on the modern market. The variety of solutions means that they are designed for certain market niches. But for effective business such device should not only meet the needs of a certain sector but also easily integrate into a changing environment. One of the printers is HP's new LaserJet 2300. This series includes many other models with broad expandable capabilities which guarantee zippy performance (HP LaserJet 2300L, HP LaserJet 2300, HP LaserJet 2300d, HP LaserJet 2300n, HP LaserJet 2300dn and HP LaserJet 2300dtn). HP LaserJet 2300 printers are meant for small groups and individuals who regard printing very seriously. They are reliable and expandable solutions with flawless printing maintained. The rapid processor (266 MHz) and large memory (32/48 MB expandable up to 288/304 MB) ensures fast processing of complicated documents. The print-server for Ethernet 10/100TX networks built in HP LaserJet 2300n, HP LaserJet 2300dn, HP LaserJet 2300dtn makes possible to share the printer by several users. All other models of this series can be easily turned into network solutions by adding such print-server. With the impressive printing speed of 24 pages per minute (HP LaserJet 2300L has 19 p/m) and the first-page printing time of 10 seconds, HP LaserJet 2300 printers work very efficiently making sharp high-quality print-outs with the resolution of 1200 dpi. Supporting PCL6, PCL5e languages and PS Level 3 emulation, HP LaserJet 2300 series easily integrates into any office environment. The automatic double-sided printing module embedded into all models with letter 'd' in the name (HP LaserJet 2300d, HP LaserJet 2300dn, HP LaserJet 2300dtn) allows saving on paper. HP's smart supplies provide maximum efficiency and accuracy of toning which cuts printing costs. This series is a very good choice for monochrome printing. With HP Embedded Virtual Machine customers can easily use electronic services with JavaTM-complient technologies. The software of HP and independent developers turns the printer into a flexible platform for service rendering. Printing up to 50,000 pages a month (HP LaserJet 2300L: up to 30,000 pages) with a standard feeder for 350 sheets (expandable to 850 sheets through additional feeders) HP LaserJet 2300 guarantees reliable premium quality printing for small workgroups. HP's all-in-one cartridges for 6,000 pages ensure superb quality during the whole service life of the cartridge. The approved printer's mechanism and the unsophisticated paper path reduce the number of paper jams. The printer's cartridge is easy to replace. HP Embedded Web Server (EWS) provides a direct network access to HP LaserJet 2300 series and supports remote control and device configuring; you can use such services as notification about events, printer status and supplies by email, control status and get diagnostic data on the device. HP's intelligent cartridge ensures stable printing quality, minimal down-time and minimal user's interference in user's operation. Beside the improved management HP LaserJet 2300 supports energy saving and environment protection. Due to the ozone release prevention and instant-on fusing technology (which reduce printing costs) HP LaserJet 2300 printers can boast of low power consumption and low-cost operation. Highly efficient HP LaserJet 2300 printers are an integral part of the company's growing infrastructure. HP LaserJet 2300 printers are offered in Europe, Middle East and Africa by all major HP's resellers and partners. Inexpensive desktop monochrome HP LaserJet printer with all key capabilities a demanding user may need. Universal laser printer which would keep up with changing needs of businesses. Users can economize at the expense of the embedded automatic double-sided printing module. HP's print-server built in LaserJet 2300n supports shared access to the printer. HP LaserJet 2300n, being a beneficial and universal network part, is ideal for a business which is going to expand in future. HP LaserJet 2300dn combines HP's best solutions for network cooperation and budget-minded users thanks to its print-server and automatic printing module. HP LaserJet 2300dtn, with the total feeding capacity of 850 sheets, is a good "industrious" printer. This universal and reliable printer with an embedded automatic double-sided printing module and print-server would satisfy growing needs of businesses. and various accessories for them such as web and photo cameras and compact folding keyboards. Ink-jet printing wasn't left aside either. In March Hewlett-Packard announced the most affordable model of a color office printer: HP Deskjet 1180c. It is designed for small businesses which need reliable and faultless printing systems. The new model has a very attractive price tag for small companies. HP Deskjet 1180c is developed for small firms and home users, and ensures stable high-level printing quality. 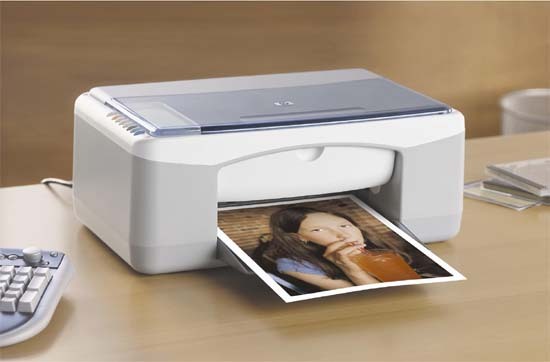 HP Deskjet 1180c supports printing of A3+ documents in the monochrome and color modes. It's interesting that this model ships only to Russia, Armenia, Azerbaijan, Byelorussia, Georgia, Kazakhstan, Kirghizia, Mongolia, Tadjikistan, Turkmenistan, Ukraine, Uzbekistan, Egypt, Nigeria and East Africa. This wide-format color ink-jet printer can work with various formats from postcards to posters (from A6 to A3+/330 x 482 mm). You can print a wide range of documents, namely tables, financial accounts, brochures, drawings and color templates due to PhotoREt III technology at the speed of 8 pages per minute in the monochrome mode and 7 p/m in the color mode. The convenient control panel with Cancel and Resume buttons and Ink Level LED also help to save time and money. The printer can use a lot of carrier types starting from ordinary paper to special photo papers and transparent films, envelopes, thick cardboard etc. With HP Smart Software you can quickly create and scale various documents of A4 format into other formats, for example, booklets, stretching or posters. In Russia HP Deskjet 1180c can be bought through any HP's reseller of partner. The expected retail price is $299 VAT included. Also, HP offers the smallest in the world all-in-one flatbed HP PSC 1210 system which is a rare find for a creative home user dreaming of a high-quality printer/scanner/copier at an affordable price. HP PSC 1210 measures only 17 cm by 26 cm (H x W) and fits in any interior. This is an ideal solution for small rooms. The convenient design with the built-in power supply unit and flexible cable make possible to place it close to the wall and in other hard-to-reach places. HP PSC 1210 works simply, fast and saves your money. Beside color printing, flatbed scanning and copying HP PSC 1210 maintains realistic photo quality thanks to HP Photoret technology and a printing mode supporting resolution up to 4800 x 1200 dpi. HP PSC 1210 was designed to be simple in handling and provide fast and flawless color printing and copying at the speed of 12 pages per minute in the black-and-white mode and 10 p/m in the color mode. Easy scanning of photos, books and even 3D images such as flowers and fabrics makes very sharp images and supports double sensor scanning technology with the maximum resolution of 19200 dpi and 36bit color. This all-in-one device has a recommended retail price of $179 (though the actual price may be different). HP's new all-in-one PSC 1210 works with HP's black ink-jet cartridge No. 56 and three-color one No. 57. These ink-jet cartridges are widely used in such series as HP Photosmart 7000 or HP Deskjet 5550. HP recommends HP's original carriers for use with HP No. 56 and No. 57 cartridges because printing components - cartridges, printers and carriers - benefit from mutual utilization. The black ink-jet cartridge HP No. 56 containing special pigment ink makes perfect prints which do not blur or fade away. The printing head has a complicated design composed of 416 nozzles; the maximum jet speed is 18 MHz. It ensures laser quality of black graphics and texts on any prints. With the ink-jet color cartridge HP No. 57 you will get genuine colors. Besides, the dye-based inks reduce the drying time markedly. The printing head of 300 nozzles and a maximum frequency of 21 kHz provides clear and sharp images with extremely small ink dots of 4-5 pl. HP's series of digital cameras has grown as well. 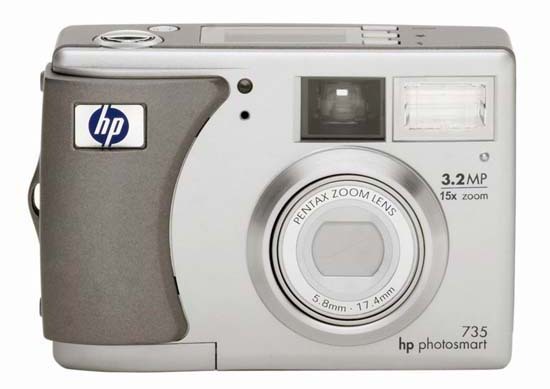 HP Photosmart 735 is a new 3 Mp camera with Pentax optical system, 3x optical zoom and 5x digital one. The camera has 16 MB built-in memory which can be extended with SD/MMC cards. The price of the camera expected in June is going to be ˆ349-399. 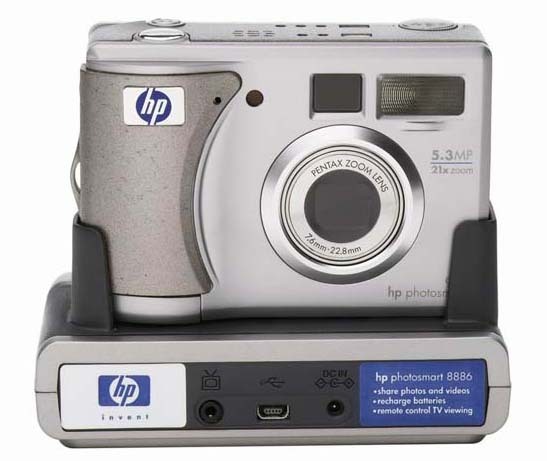 Another HP's solution, Photosmart 935, is a 5Mp camera with a 3x optical and 7x digital zoom. Like Photosmart 735, the new model is equipped with Pentax optical system and 64 MB fast memory. This model supports SD/MMC Flash cards, with a 32 MB SD card thrown in the box. Photosmart 935 is going to arrive in May at the recommended price of ˆ599-699.